This is from the May 31, 2011 issue of ESPN the Magazine, appearing across pages 22-23; a reproduction of this image: http://www.pbase.com/image/134722579. 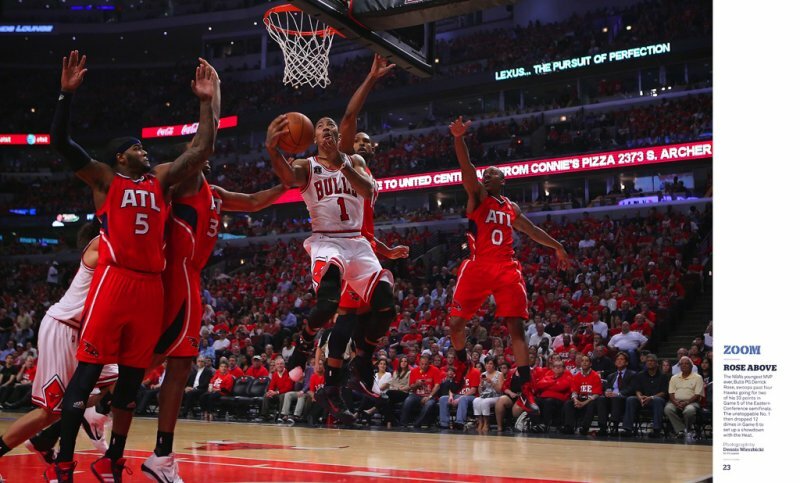 The NBA's youngest MVP ever, Bulls PG Derrick Rose, swoops past four Hawks going for two of his 33 points in Game 5 of the Eastern Conference semifinals. The unstoppable No. 1 then dropped 12 dimes in Game 6 to set up a showdown with the Heat.